Zakia Smith, HGHS senior, was crowned the 2018 Homecoming Queen Friday evening at Warrior Stadium during the halftime coronation ceremony. She is the daughter of Steven and Deveda Smith of Honey Grove. Other senior nominees were Bree Cason and Kelsee Frost. Crowning the new queen were the Class of 2018 Alumni Queen Bella Morrison and the Class of 2009 Alumni Queen Kati Ashley Tollison. Junior Beta Club representatives, Michael Contreras and Eli Cunningham, escorted the two former queens. 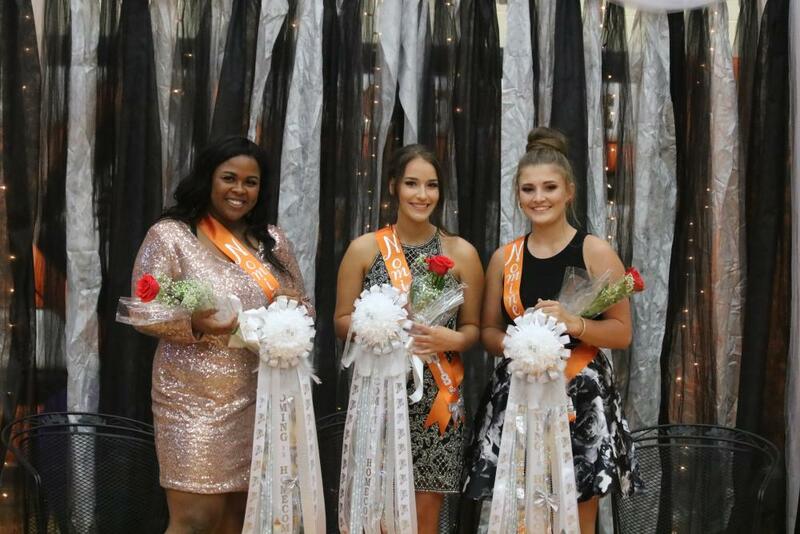 Senior Beta representatives assisted on the sidelines with the coronation ceremony: Amelia Butler, Makenzie Harper, Raney Hodges, and Whitney Mahan. The Warrior Marching Band Color Guard also provided a regal touch with their flag salute to the nominees. The nominees were first presented at the afternoon parade, riding in convertibles provided by Murray Jackson of Honey Grove, Jack and Virginia Staes of Honey Grove, and Carter Womack of Blackland Motors. Murray Jackson, Larry Mariani, and Virginia Staes drove the girls onto the Warrior Field. Special honorees for this year’s homecoming were the Class of 2009. Those in attendance and registered were as follows: Catherine Bell Duff, Jordan Finney, Raven Finney, Monique Gonzales, Dylynn Hokett, Sam McCarty, Laura Milford, Chelsey Pitcock, Kati Ashley Tollison, and Braley Barnett Townes. Warriors Around the World was the Homecoming theme this year. After a busy week with competitions and decorations and with four competitions accounted for, the overall winner was the Sophomore Class with an Egyptian theme. The Senior Class finished in a close second with its Japanese theme, followed by the juniors and freshmen tied for third, focusing on Mexico and the United States respectively. The week began with War Games on Monday evening where the Senior Class took top honors overall. The sophomores followed in second, with the juniors and freshmen tied for third. In dress-up competition, the freshmen pulled out all stops for a first-place finish, followed by the sophomores in second, the seniors in third, and the juniors taking fourth. Class spirit signs and theme-related signs in the gym were judged together. First place went to the sophomores and the juniors pulled in second to keep their hopes alive. The freshmen rallied and received third, while the seniors settled for a fourth. Float competition proved the deciding factor. The Japanese tower and flower décor put the Senior Class on top. The Junior Class brought in second with Coco for Hoco. The sophomores garnered third with an Egyptian tomb approach, while the freshmen landed in fourth with their tribute to the U.S. military. Everyone seemed to have a great time, even amidst the heat and wind. All the students, faculty, parents, and community members helped make this year’s homecoming a success! A special thank you goes out to all those who judged wall signs and floats.